Keith never liked caramel much, unless it was in a Lion or a Mars bar. I always agreed with him, we used to joke about it and say that whenever the big mass producing confectionery companies wanted to make a candy bar and wasn’t sure what to pad it out with they would have a meeting and the people would say to each other: “Let’s fill it with wafers or caramel. I know, let’s fill it with both!”. I think I have a point, because how many bars aren’t there like that? Caramel these days is used like a cheap filling ingredient, when you’re too stingy to afford good ingredients or not creative or daring enough to try something new. It’s a shame it’s gotten to this. I’m saying this because recently I’ve learnt that caramel can be something good. I don’t particularly like Hotel Chocolate because their chocolates all taste so similar but that was still the first time I had a good quality caramel filled chocolate. The caramel in them wasn’t just a sugary substance, it was something that had lots of flavour in itself. I guess what I’m trying to say is that caramel is like vanilla; an ingredient (or lack thereof in the case of vanilla) that is extremely abused by the mass producing companies that can be great if done correctly. 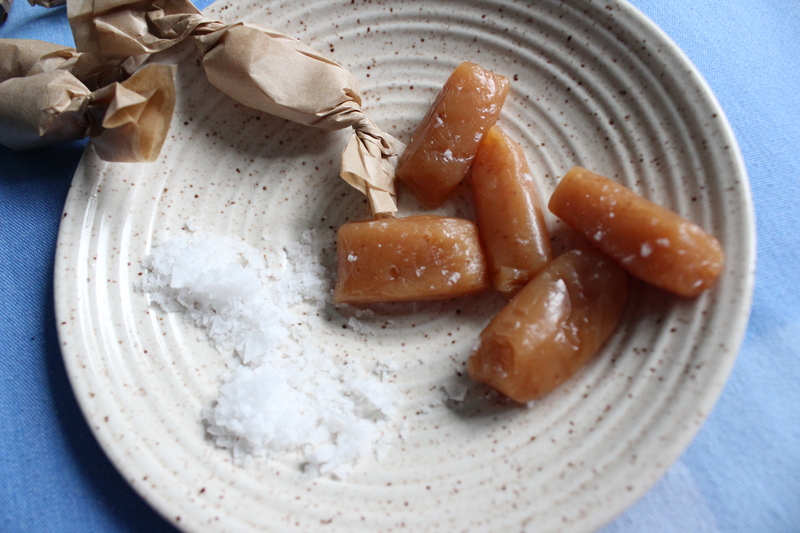 I had finally gotten to the part in Greweling’s book about non crystalline confections and I decided to try to make some caramels, because I felt like the cooking of sugar is a very basic concept that I have to know inside and out. 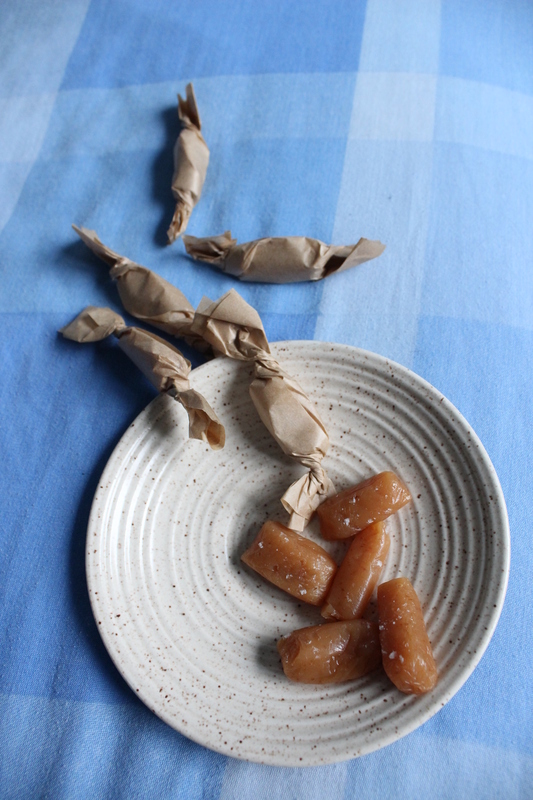 I was a bit apprehensive because people sometimes say that good caramel is hard to make, but it wasn’t that bad. You can’t see it from my pictures but I didn’t stir well enough so there are tiny little spots of browned sugar in some of the caramels that came off the bottom of the pan but apart from that I had no trouble making them. I don’t have a confectionery frame so had to use a tin with greaseproof paper in but I used a really bad type by mistake that everything sticks to so the caramels didn’t look as perfect as I wanted but that’s for practice. This recipe makes a quarter of the original recipe. The tin size is approximately, you can use a slightly bigger or smaller depending on desired thickness you want. Remember to stir all the time while the caramel cooks. Mix the sugar, sweetened condensed milk, water and vanilla pod scrapings in a saucepan, bring to the boil while stirring constantly. Add the glucose syrup and lower the heat to medium while stirring, let the mixture get to 110 degrees C/230 degrees F, add the butter and keep stirring it until it reaches 117 degrees C/243 degrees F. Do a soft ball test to make sure it’s ready and remove from heat, add the salt and pour the mixture into a 20 x 10 cm/8 x 4 inches tin lined with oiled greaseproof paper, let the caramel get to room temperature before you cut them. This entry was posted in Confectionary and tagged caramel, Greweling. Bookmark the permalink.